I finally managed to take the time out to pop down to the Morris Miller Library, UTAS, to have a good look at the Moss Mania exhibition. Unfortunately I had missed the launch of the exhibition due to sickness. The exhibition was situated in the exhibition cases at the entrance of the Morris Miller library, with Dr Rod Seppelt’s work was featured in a row on top, and those of Lauren Black were at the bottom. Immediately apparent was the contrast in artistic styles of the two masters. Rod’s work was done in Indian ink on polyester film, producing a bolder effect. It also included technical histological illustrations of leaf and stem sections. Lauren’s work were pencil drawings and had a more aesthetic feel, with a focus more on capsule details. Nevertheless, it is without a doubt that both are first rate artists and have achieved mastery of their craft. 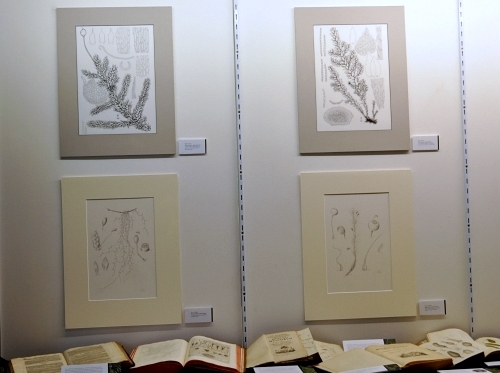 In addition to displaying the botanical artwork of Dr Rod Seppelt and Lauren Black, the Moss Mania exhibition also featured an impressive number of old books and short biographies of botanists and botanical artists involved in the early years of bryology (the study of bryophytes). An example of one priceless volume was a book published in 1798, the Theoria generationis et frutifications plantarum cryptogamicarum Lannaei: retractata et aucta by Johann Hedwig. Book titles were rather verbose at that time, it would appear. While it might seem alien in our current times where virtually everyone spots a camera, some of the early books on bryology actually had real specimens pressed between it’s pages. I had only ever read of something like that until I saw it with my own eyes in the exhibition. The only other logical means for those early bryologist to depict the subjects of their study would have been via illustrations, and this art it seems, was elevated to a rather sublime level by the 19th century. 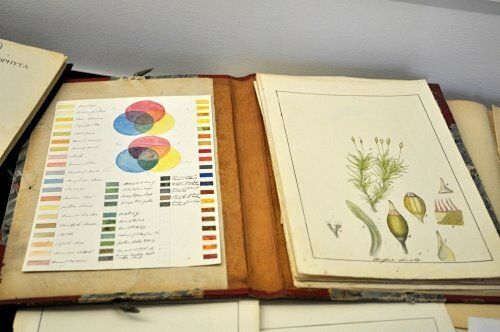 They even had a system of colour codes so as to accurately depict the colours of the plants they were illustrating. Modest as the exhibition was, it is impossible to leave without an appreciation of the intricacies required in the craft of botanical artistry, and the rich historical context that has culminated in the sublime artwork of the women and men who continue this admirable art-science synthesis. The Moss mania exhibition continues till the end of November. Lauren Black studied at the Royal Botanic Gardens, Melbourne and has been producing botanical masterpieces since 1997. Lauren has won numerous awards for her artwork and continues her work as a freelance solo artist and teacher A more detailed profile may be found on her professional website. Rod Seppelt joined the Australian Antarctic Division in 1978 and is a adjunct professor at the Institute of Arctic Biology, University of Alaska, USA. 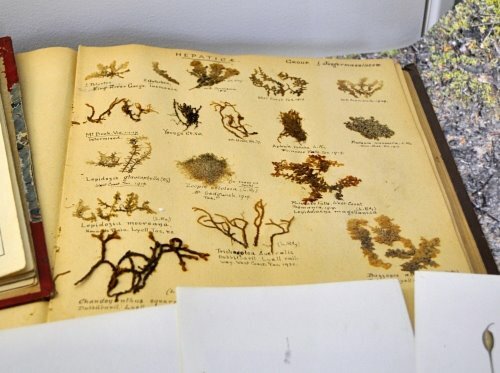 He has published a book, The Moss Flora of Macquarie Island, and continues to work on drawings for projects like the Flora of Australia. His profile may be seen at the Australian Antarctic Division’s webpage. 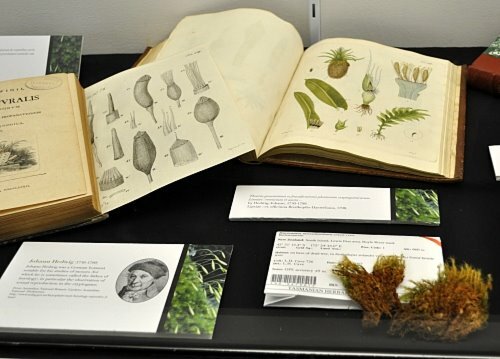 This entry was posted in Botanical History, Bryophytes, Events and tagged botanical art, botanical illustrations, Bryophytes, Events, Lauren Black, Morris Miller library, Moss Mania exhibition, mosses, Rod Seppelt, University of Tasmania. Bookmark the permalink.